My tribute to Bob Wootton, Johnny Cash's guitar player, R.I.P. 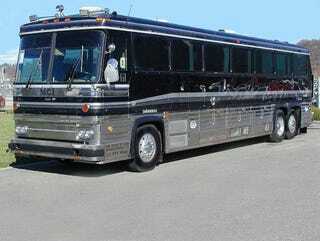 Johnny Cash’s personal custom tour bus, J.C. Unit One. Photo courtesy Dave Wright. Sad news to share this week that one of my former clients, and valued friend, Bob Wootton passed away at the age of 75. He was the guitar player for Johnny Cash’s band The Tennessee Three (I was their personal manager) from the time that John’s original guitarist, Luther Perkins, died in a house fire in 1968. He took the familiar style Luther created and innovated it into something that soon became entirely recognizable as the Johnny Cash sound. Sure John was the voice, but this man was the music we all think of when we hear the name Johnny Cash. Bob told me he even wrote many songs and lyrics that he was never credited for, modestly preferring to allow John’s star to shine brightly. In Bob’s honor, here is an article I wrote in 2011, but am sharing here again today in tribute to this special man and music legend. I’ll miss ya’ buddy, see you on the other side.